The safety of electric cars is an overlooked subject. Many people would think they are as safe as any car running on gasoline, but they are not. Our cars are safe because they have large crumple zones at each end, the biggest one in the front, with the engine being an important part of it. It’s not the same with an electric motor, as those are always much smaller. Consequently, the crashworthiness of the car has to be entirely reengineered. 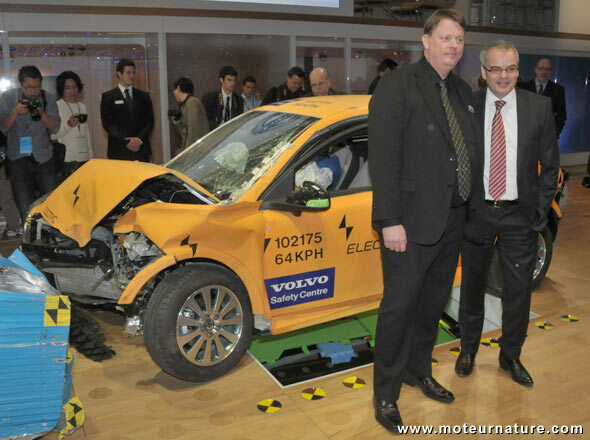 Safety have always been a strong point at Volvo, and the Chinese-owned Swedish brand is the first ever to show how an electric car looks like after a 40-mph offset frontal collision with a barrier. It’s not that bad as the passenger compartment has been unaffected, and both the batteries and the cables, which are part of the electric system, remained intact after the collision. In that end, a “split battery” with half the battery located in the central tunnel between the seats and the other half under the rear seats where the gas tank would normally be located, has been designed specifically for Volvo by Ener1, the American manufacturer. 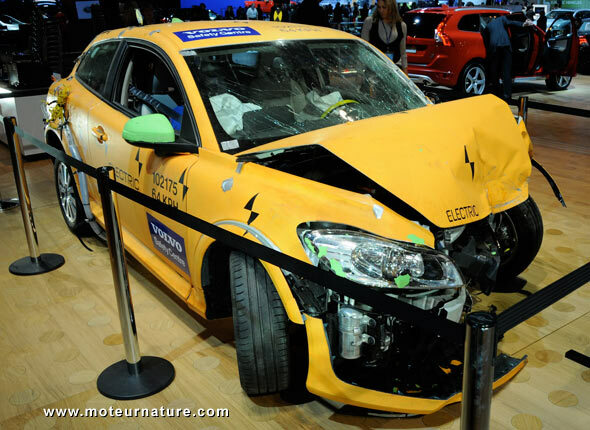 Of course, the crash test was performed with the battery fully charged, and Volvo was proud to explain that its forthcoming electric models will be as safe as its other cars. This would be good news if we knew when an electric Volvo would be available to the general public… Maybe in 2013?